After an eventful regular season, the men’s and women’s cross country teams travel to Tallahassee to compete in the ACC Championship meet this morning. Both teams look to have strong outings against one of the best running conferences in the country. Following the conference meet, the teams will have two weeks to prepare for the NCAA South Regional meet. 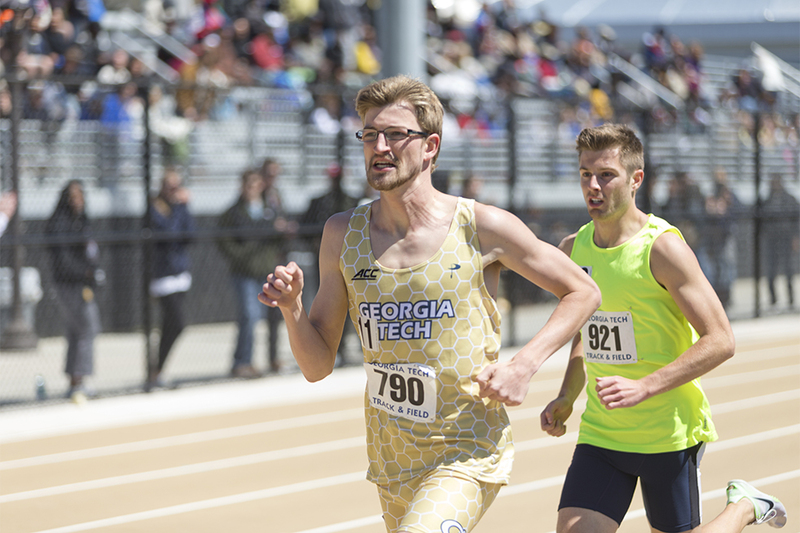 On the men’s side, seniors Jeremy Greenwald and Brandon Lasater are expected to finish first and second for the Jackets, while sophomores Nahom Solomon and Matt Munns will also vie for a top spot. Senior Zane Coburn, along with juniors Alex Grady and Patrick Fleming, are poised to round out the top seven for Tech. Juniors Hayley, Keady and Melissa Fairey will lead the pack for the women. Senior Morgan Jackson, junior Sarah Bowles, and freshman Alexandria Melehan comprised the rest of the top five for the Jackets at the Pre-Nationals meet and should produce similar results this morning. The teams have been decreasing their mileage in the past few weeks in preparation for these important meets. The teams’ workouts are structured this way by design, in order to do most of the hard work earlier in the season and build a base so that the team can focus more on speed work and be a little fresher for the more significant meets. For example, Lasater’s weekly mileage is now in the 60s compared to his mid-70s mark in the beginning of the season, but he says that most of the younger members have had their totals cut even more. The women lost several runners from a year ago due to graduation, and coming in to the season it was up to Keady and Fairey to assume leadership roles. Fairey feels that they have succeeded in doing so and brought the team closer together. “We try to bring everybody together and demonstrate a hard work ethic at practice, and train to be the best and stay focused,” Fairey said of her team. “I try to serve as an example and help out the freshmen. She feels that the extra effort to bring the team closer together has reaped its benefits during races. Lasater is one of the leaders on the men’s side, and he prefers to lead by example. The top two teams from each regional meet automatically qualify for nationals, while some additional teams can receive at-large bids. The top four individual finishers in each region from teams that are not selected are also invited to nationals. The weak south region means that the teams have a chance, though it is slight, at qualifying for nationals. However, there is a much better chance for an individual to make the cut and represent the Jackets instead. Lasater feels that if they have a good day, himself, Greenwald, or Solomon could run well enough to qualify. At the ACC meet, the teams will mostly focus on how well they compete with other teams in the south region, such as perennial powerhouse Florida State. Comparing themselves with these teams will serve as a good barometer for how well they can expect to perform at the regional meet. Hypothetically, if both teams were to pull off the upset and win the conference meet, both Lasater and Fairey agree that it would be the best accomplishment of their collegiate cross country careers. It is an unlikely scenario though, as Tech is more of a track school, and running for all three seasons puts the runners at a disadvantage compared to cross country focused programs. “It’s hard to peak so many times every year, to get the most out of your training when you’re expected to go that many times,” Lasater said. “Professional runners run really incredible times mostly because they do a lot of base training and they only have to peak once. In fact, as a middle distance runner, Lasater feels that he is better suited for track. He puts himself into a different mindset for cross country races in order to not tire himself out too quickly. “I really like the competitive aspect of track, so it’s kind of hard to curb it for cross country,” Lasater said. “I always want to be vying for the win, but with cross country and the way our training goes it’s just not realistic to expect to win all the races. You just have to restrain yourself, and that’s the hardest part. It’s also hard just not starting out too fast in races. I may be able to run a fast first 400 but I’m going to regret it later. For these next two races, Lasater will employ the same strategy that he has lived by over his career: he plans to start conservatively and save his energy over the first few miles before increasing his pace and trying to catch as many runners as he can. It is a common strategy employed by middle distance runners, as they have both the speed and endurance to gain quite a lot of ground in the final stretch of the race. Lasater hopes that this strategy can carry him to a berth in the nationals meet. If nothing else, it will give him and the Jackets the best chance to finish strong this morning and give them confidence as they head into regionals.